Williams drivers Felipe Massa and Valtteri Bottas say they have resolved the team orders row that blew up at the Malaysian Grand Prix. Massa refused to let Bottas pass him late in the race and said Williams had made a "mistake" asking him to do so. "Everything was discussed and it should be fine," said the Brazilian. "It won't happen again until it is the right time. That was not the right time." Massa felt it was wrong for Williams to ask him to let Bottas through because the season had only just begun and both drivers were running to the same strategy. He also thought Bottas would not have been any more successful in passing the McLaren of Jenson Button. Williams said later that they intended to let Massa back past Bottas if the Finn failed to clear Button within a couple of laps, but this was not explained at the time. "I'm not against team orders," Massa said. "It is part of our sport. But I didn't expect what happened last weekend and it was not correct and the team knows that." The radio message from Williams to Massa contained the same phrase Ferrari used when instructing the Brazilian to hand victory to Fernando Alonso in the 2010 German Grand Prix. Massa said he had found this "funny". 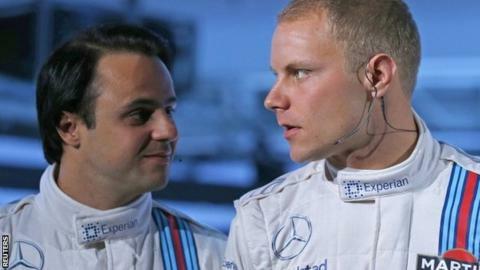 Massa insisted the incident in Malaysia had not caused problems with Williams, whom he joined this season from Ferrari. "I don't think it damaged my relationship with the team," he said. "If I do a mistake, I will be the first one to say sorry."